If and when Ozawa Ichiro becomes prime minister — still not a done deal, despite the Aso government's latest misstep — his will likely be the most highly anticipated premiership in decades, if not ever. I do not mean anticipated in the sense of public hopes for his government, but simply in the sense that Ozawa has been a possible premier for nearly twenty years. To some he is the great disappointer for having failed to destroy the LDP when he drove it into opposition in 1993. To others (including, not surprisingly, many in the LDP) he is the politician they love to hate: dictatorial, secretive, treacherous, the true heir to the great kuromaku Tanaka Kakuei. But however one sees him, the past twenty years may one day be remembered as the age of Ozawa. It is little wonder that as an Ozawa government becomes more likely, debate over Ozawa's fitness to govern has grown in kind. Ozawa has helped stoke controversy — surely he knew that his remarks on the future of US forces in Japan would prompt criticism — but the speculation about how Ozawa would govern goes far beyond responding anything Ozawa has said. If anything, it is a response to the perceived vacuum surrounding how Ozawa plans to govern. This is the impression given by a lengthy Sankei article considering the structure of a DPJ government. (The first part is here; the second part is here.) Sankei paints a portrait of Ozawa as a purely political animal, who has transformed the DPJ into an organization designed to contest elections but has nothing to say about the economic crisis washing over Japan. 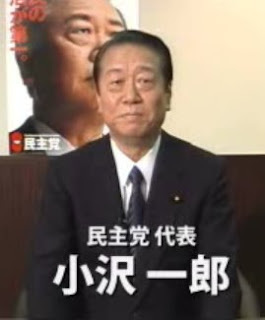 Featuring quotes from anonymous critics from within the DPJ, the article claims that Ozawa has changed his colors since 1993, having been a small-government conservative in 1993 when he published Nihon Kaizo Kaikaku ron (published in English as Blueprint for a New Japan) but now campaigning as a veritable socialist, or at the very least an LDP old guardsman, putting politically convenient pork before policy. There is a grain of truth to this criticism, but nothing more than a grain. The Ozawa who wrote Blueprint is still present in the Ozawa who published Ozawa-shugi (Ozawa-ism) in 2006 after becoming DPJ president. Ozawa still believes in the importance of changing how Japan is governed, centralizing the government in Tokyo in the prime minister while decentralizing the country as a whole. But more than any particular policy, he still believes that the revolution Japan needs has as much or more to do with how power is wielded as with the ends to which it is wielded. Accordingly, criticism of Ozawa as secretive or governing without consulting with others is overstated. Should Ozawa be more open to advice? Perhaps. But Japan is surely all too familiar with leaders who have fallen on the opposite end of the spectrum, being incapable of acting without the approval of the bureaucracy or LDP leaders, more first among equals than truly the head of government. If Ozawa has any hope of initiating the revolution he desires — and the changes his party has planned for the bureaucracy will amount to a revolution if implemented — arguably he has little alternative but to rule in the manner of Aso's grandfather, as "one man." Sankei also reprints some of the standard questions about a DPJ government. Are there enough experienced politicians to fill the posts the government proposes to create? Is Ozawa healthy enough to last in office? Will the party fall to pieces when it tries to choose a successor? Can the party and its potential coalition partners unite around a common agenda? These questions are perfectly legitimate, but they are also unanswerable for the time being. Would the formation of a DPJ government at this point be risky? Absolutely. But would it be any less risky than returning the LDP to power? Why should anyone support an LDP that doesn't know whether it is old or new (as Nakagawa Hidenao acknowledges as a problem for the LDP)? When the outlook is as grim as it is today — and the incumbent government is as bereft of ideas in the face of the crisis as the Aso government is — surely change in and of itself is a good thing. Japan is in need of radical change and, as Tamamoto Masaru suggests in the New York Times, bold leadership. For the foreseeable future, a DPJ government headed by Ozawa, while being far from perfect, may be the closest Japan gets to either. On that note it bears returning to Ozawa's remarks about the future of US forces in Japan and Japanese security policy. MTC continues to see Ozawa's remarks as deeply unrealistic, lacking any notion for how he plans to make up for the absence of US power as a deterrent for Chinese adventurism in the East China Sea. I take his point, but he is still, I think, attributing too much to Ozawa. I agree with everything MTC says about how Japan will get to the endpoint envisioned by Ozawa, as Japan lacks the experience and, more importantly, the funds to fill in for US forces. But MTC mistakenly assumes that Ozawa was suggesting that this goal was to be realized in the first years of a DPJ government (or the next decade for that matter). As Nagashima Akihisa notes at his blog, Ozawa's remarks were not in a speech at a university or a think tank but rather offhand comments to the press gaggle. Nagashima chides Ozawa for failing to treat the subject with greater prudence, and especially for failing to provide a timespan for his thinking. (He suggests that Ozawa's vision would take 15-20 years to realize.) Nagashima hopes that Ozawa's remarks are the beginning of a discussion within the DPJ regarding the future of Japanese security policy; I wholeheartedly agree. However impossible the idea of Japan's being capable of replacing the US presence is in the short term, one thing is certain: Japan will never be capable of replacing the US if its leaders refuse to raise the issue for fear of offending the US government or upsetting Japan's neighbors. All of which goes to suggest that Ozawa's error was the casual manner in which he raised the subject, not the subject of his remarks. Japanese rearmament, provided the government can figure out how to pay for it and even if it is undertaken only to replace relocated US capabilities, must proceed prudently, deliberately, and with the maximum degree of transparency. Hopefully Ozawa has learned the price of nonchalance — and will proceed in making this question a subject of national discussion. It will not be for his government, should it ever exist, to realize, but the debate has to start sooner or later. Preferably sooner.